In the most difficult of times and in the midst of some of our most gravest circumstances, there is always a glimmer of hope, even when it seems like your faith is gone. 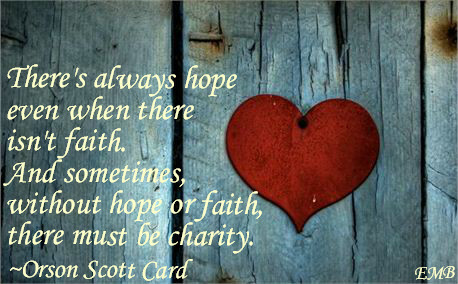 At times both hope and faith are gone and things appear to really be falling apart. But God's Spirit lives within us, it is from Him we get the courage to move on. We brave the storms, and persevere, rather than giving up. We pick ourselves up, we dust off our hands and our knees and we press onward on life's journey. Tina Turner once sang a song, 'what's love got to do with it?' To us I say, love has got everything to do with it! We are able to stay the course, to continue the journey because of God's love that has been spread abroad in our hearts by Christ Jesus our Lord. Love conquers all! Love never fails! Love keeps us together! Very well said. His faithfulness and love towards is so wonderful. Hi Yum Yucky, thank you for taking the time to visit my blog and for leaving your comment. It is well appreciated. Blessings!